Sunday was to be the day that I decorated our porch for the holidays with lights and merriment. But then I spent hours Christmas shopping and returned as darkness was setting in. (For the record, that happens starting a little after 4 pm these days … the December darkness is a little maddening, to be frank.) Still, I wanted to follow through with my plans. The supplies were gathered. The stick on hooks hung and the lights plugged in. I even created and attached the bow for my wreath (a little task that means big money savings). The lighted garland around the door stayed put for about 20 seconds. Then the hooks fell, one at a time. I tried again with fresh sticky strips. Again, they fell. Shawn tried. And they fell again. At least the wreath is up, right? Sometimes, our best efforts don’t get the results we want. Sometimes, we do the same thing we’ve done before and it doesn’t work. But that’s okay — it’s life. You live, learn and grow. And, then you decide to hang the garland somewhere else so that it doesn’t keep falling. Plans change, and that’s okay. You just kind of have to roll with it. 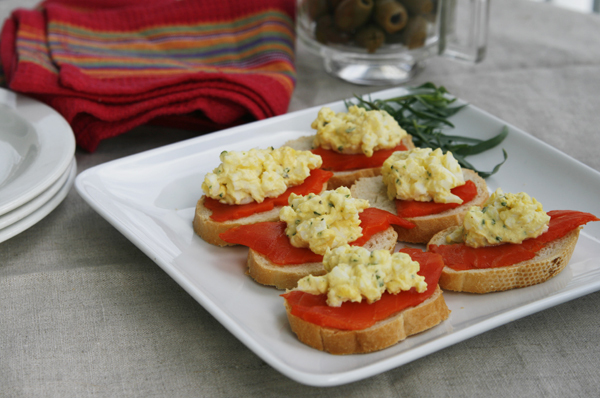 Or you make a delicious little crostini that marries those creamy, salty, crispy flavors and textures you love. Ok, maybe that’s not a solution to the lights problem per se, but they are pretty, tasty and easy — a trifecta of goodness. 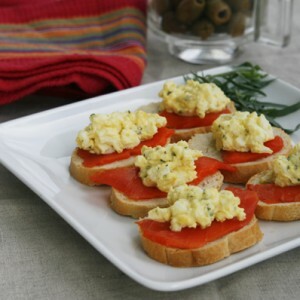 This appetizer is simple yet elegant. It’s the kind of thing that you can be proud to serve at any dinner party or holiday party — or even to bring along to parties. 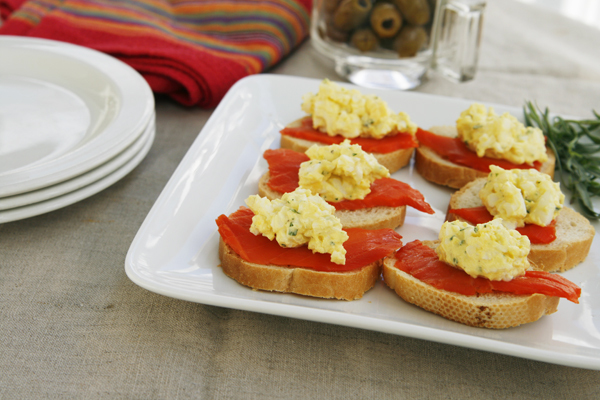 The salty smoked salmon is topped with tarragon-laced egg salad and served on a crispy crostini. It’s so easy, and yet so delicious too. 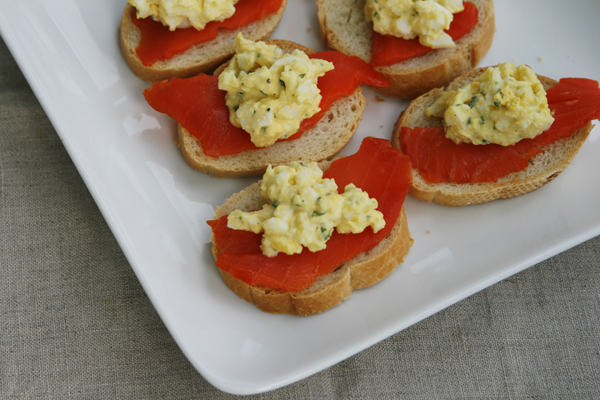 If you are making this for a party, make the egg salad ahead of time (you can make it up to a day in advance) and cut the salmon into pieces so all you have to do is bake the crostini and assemble them. Easy peasy. Are you all decorated for the holidays yet? Preheat oven to 350 degrees. Place the slices of French baguette on a baking sheet. Bake for 8-10 minutes, until hardened but not browned. Remove from the oven. Finally, assemble the crostini. Place a piece of salmon on each of the baguette slices. Top with tarragon egg salad, divided evenly among them. Enjoy! Disclosure: Although I am a member of the Hellmann’s Real Foodies team, all opinions are my own and I wasn’t compensated in any way for creating this recipe. I’m looking forward to the days getting a little longer. It’s so hard to get everything done before dark.